Until I get my notes together and determine what is and isn’t appropriate to discuss in the public blogosphere, I will at least post here for your downloading pleasure the slides from my Keynote address. I was invited by Lisa Porter and Rita Bush to share thoughts on technology and the future of analysis, and since it was pretty open-ended, I wove together some thoughts about bringing greater speed and greater scale to intelligence analytic operations. 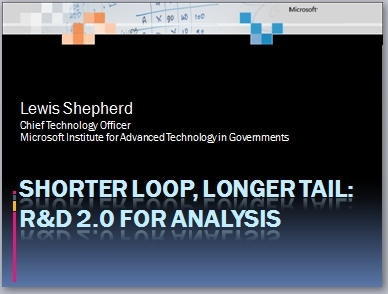 The title, “Shorter Loop, Longer Tail,” describes the OODA speed aspect and the long-tail framework and their applicability (I argue necessity) to improving traditional analysis. I do see great potential in current MSR projects to address areas of technological benefit to analysis — for example, cloud computing and secure mashups, semantic computing, robotics, and something I called the “Virtual Long Tail,” combining geospatial visualization, advanced modeling and simulation in virtual worlds and mirror worlds. I’d appreciate any feedback or thoughts on the slides, and would be happy to expand on particular research projects by email.